Rep. Tulsi Gabbard (D., Hawaii) faces a tough primary challenge if she decides to run for reelection to Congress, even as she struggles to gain traction in her presidential campaign. The 2020 candidate has not said if she is running for reelection, but Hawaii law permits her to run in the presidential and congressional primaries simultaneously. Gabbard also feuded with Hawaii Democratic senator Mazie Hirono earlier this year. The congresswoman accused the senator of "fomenting religious bigotry" after she questioned a judicial nominee about his membership in Catholic organizations. A Hirono spokesperson countered that Gabbard "based her misguided opinion on the far-right wing manipulation of [Hirono's] straightforward questions." Gabbard's challenges at home come as she has yet to find her footing in the 2020 presidential campaign. She currently finds herself averaging less than 1 percent support in the RealClearPolitics average of Democratic primary polls. The Hawaii Democrat's campaign has been marred by apparent turmoil and disorganization. Her team was reportedly unaware she was going to announce her candidacy in mid-January, and her campaign manager and digital consulting firm left the campaign soon after it officially launched over two weeks later. Gabbard's foreign policy views have faced scrutiny in the media. She refused to call Syrian dictator Bashar al-Assad a war criminal during a CNN town hall last week, despite his use of chemical weapons on civilians. She would not call Assad an enemy of the United States during an interview on MSNBC last month, and dodged when asked to more specifically categorize his relationship to the United States. Gabbard has stood by her decision to meet with Assad in January 2017. A few months later, the Syrian dictator was accused of carrying out a chemical attack on civilians in the Damascus suburb of Douma that prompted U.S. missile strikes in Syria. The Assad regime has also employed barrel bombs indiscriminately. Her presidential campaign travel schedule has also raised eyebrows. "The underdog Democratic candidate has dropped into early caucus and primary states like Iowa and New Hampshire, and on Friday, Gabbard’s campaign announced a pair of town halls in Nevada," Politico reports. 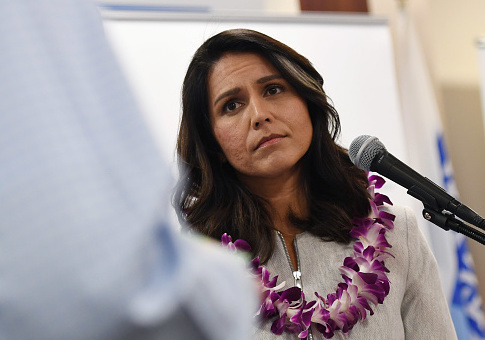 "But Gabbard, who is Hindu, has focused more on stopping in communities with large South Asian communities in states with less 2020 influence — a scattershot approach that calls into question whether Gabbard and her noninterventionist foreign policy can make a mark on the 2020 race." "It does appear to me that her candidacy is really not one that’s trying to win, it’s one that’s trying to bring a foreign policy perspective to the race in terms of nontraditional alliances and nonaggression and form a peace plank," a former adviser to Sen. Bernie Sanders in 2016 told Politico. "So she doesn’t care about going to South Carolina because she’s not legitimately trying to seize the nomination." Although her campaign has added a few staffers, it is "largely operating outside typical Democratic and progressive circles," according to Politico. "I have no contact with her or her campaign. I don’t even know anyone that’s working with her or her campaign," said Jane Kleeb, chair of the Nebraska Democratic Party. "I think for a while she was a darling of the progressive movement," Kleeb added. "And then anybody I know, any leader I know, just thinks she’s weird." This entry was posted in Politics and tagged 2020 Election, Tulsi Gabbard. Bookmark the permalink.